Unfortunately, six months into the strip’s run the Twin Towers were destroyed and cartooning about movie marketing schemes and celebrity misadventures didn’t seem so important any more. Over the next year, the strip veered into overtly political territory and was getting darker in tone than I enjoyed. Also during that time a number of things happened to lead me to end the strip: The Tornado folded, posting strips on my website at the time wasn’t very satisfying for me, I wasn’t able to find a syndicate interested in the strip, and Watusi jams were keeping me busier (and making me happier) than “C&V” was. The final nail in the “Continuity and Vine” coffin, though, happened when someone at a show said he was glad to read my comics … so he’d know what to think about the news! I certainly wasn’t writing these strips to become some sort of political guru! 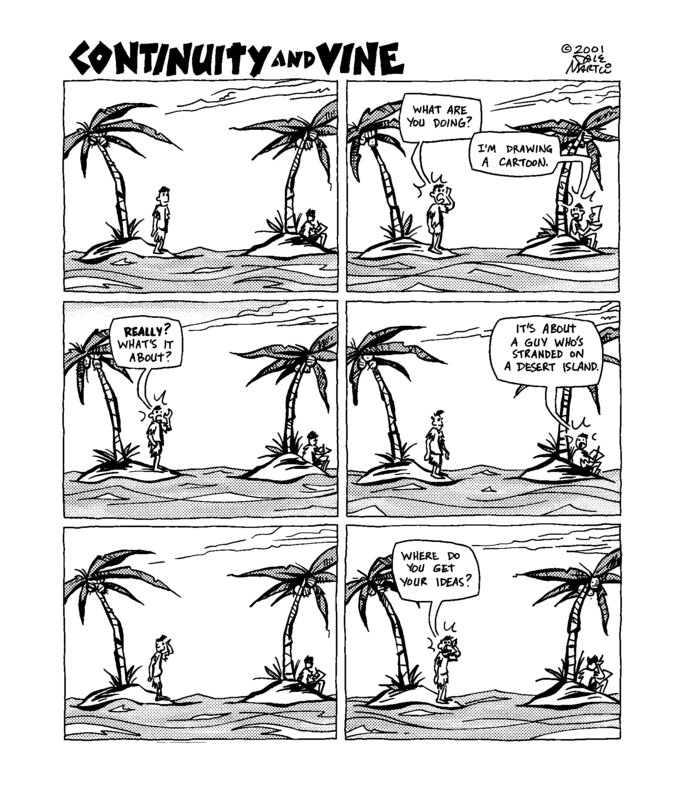 When I closed out my old website there was a fair amount of content I wanted to continue providing a home for … including this “Continuity and Vine” strip from 2001. The island strips were some of my favorites from that entire project, before it veered into overtly political territory. Plus, from the creative side, it was gratifying to experience how they just fell into place– five themed strips in a couple of days. Hope you enjoy! I’ve also been testing out e-books as a way to keep select out-of-print materials available. If you have an e-reader that can handle .pdfs, feel free to download the collection Days of Wine and Anthrax, where you can read all the island strips, along with other “Continuity and Vine” comics. Let me know how it works on your reader!